If you live with diabetes, whether it affects your body or that of someone you care about, then this is your album! The stories you thought no one else could tell! This is not a "how-to" CD. It's a "what- is" collection of songs which tell the stories of every-day life with diabetes. Yes, believe it or not, here is one diabetes-related item you won't want to hide in the "medical" corner of your bedroom! The 13 songs address aspects of living with diabetes that aren't usually discussed in most self-help books or support groups. Everything from those behavior whoopses that can happen with a low blood sugar, some of the silly things you think no one else has ever done, the nagging fears you keep to yourself, your relationship with food, what makes you stick to your regimen when you don't think you can, and so much more. Along with the unforgettable lyrics and melodies, your ears won't believe what I've done with all the medical equipment you've come to love and hate! Yes, you will hear recordings of lancing devices, insulin pumps and blood glucose meters which become part of the instrumental ensemble. Click on any song title to go to the page containing its complete lyrics. 1. Why? Do you ever struggle with thoughts of why you, of all people have to put up with living with diabetes? Do you keep these thoughts to yourself because you constantly hear that you should feel oh so positive about this disease? This song is your chance to admit that naturally you're going on with life but there's plenty of room for the occasional whine! 2. My First Date Since… Do you remember the first time you went out in public after starting on insulin or any other diabetes management regimen? Were you secretly just a bit terrified of what would go on in your body out there, away from the comfortable medical settings? Here's your chance to see that the rest of us were also filling our heads with crazy questions and concerns. Yes, you were normal! 3. Open Your Mind Or Shut Your Mouth! Oh, don't you just love all those people who know exactly what you should and shouldn't eat, know precisely how to cure you, and never stop telling you what they think? Trouble is, yes, you do love some of them! This is the song that just might get them off your back. If you are one with all the answers, it might help you keep a foot or two out of your mouth! 4. Good-bye, Old Friends Just because we get the diabetes diagnosis, do we suddenly see things which were part of our culture as "bad"? How do we grieve the losses and adjust to the changes? This song presents an angle not often covered in "support" groups. 5. Honey, Are You Low? Have you ever gotten into an argument with someone, only to hear those words, "Are you Low"? Did that push your buttons even more? Here's the song that will make all of you laugh about it. 6. In Exam Room Number Two Oh those thoughts that go through our heads as we sit in that little room, waiting for the doctor to come in. Nervous? Don't want to talk about what you ate? Wishing you were somewhere else? Those thoughts are in this song! 7. My HNO There's no getting around it! Dealing with insurance companies is part of living with diabetes. And that's not a typo in the title! It's what it is! Here's a chance to have some fun with the frustrations and aggravations that take up a lot of time and energy. 8. Is It Just Me? Do you ever secretly drive yourself crazy when you feel any strange symptoms? Are you already living with some diabetes complications and wondering if others blame you? As you work through these adjustments, here's hoping it helps to know that these thoughts were common enough to appear in a song. 9. 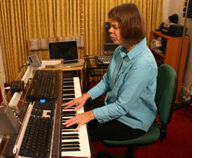 The Numbers Game Any activity which is part of normal every-day life usually makes it into music. So get out your dancing shoes and sing along with this little number! Or do you need to hit pause and do a finger stick first? 10. Fingers, Calm My Fears! Have you ever felt bad about pricking your fingers every day? Here's your chance to make it up to them. 11. A Tough Guy There's always one person who just seems to do what's necessary; no argument; no problems; no backsliding. Know anyone like this? Is this you? So, what really happens when there's no one else around? 12. Just A Pain In The… Here's a light-hearted look at every-day life, including some of the mischievous things we can do and the funny things we confront. 13. The Promise When you feel like you just can't do this any more, what is it that makes you do what you have to do--- Again? Will you be singing this song to someone special? Response to these songs, regardless of diabetes diagnosis, has been phenomenal! Comments have included: "Wow! I never thought I'd laugh about anything related to diabetes." "Oh I can't wait to play this for my husband. Maybe we'll stop fighting over how I handle my diabetes." "I never realized that all of those deep feelings I had were this common. You should package the CD with a box of facial tissues." "These are tears of relief. I've never heard food portrayed like this before." "These songs deepened my sense of admiration and compassion for those who deal with diabetes every day with no break." "I understand my friend a little better now. Sure wish I hadn't said some of the things I said." "Now this is real diabetes!" and more. This album is entertaining yet thought-provoking. When you hear these powerful and compelling songs, you laugh! You'll cry! You'll never look at a finger stick in the same way again! I hope it will make you laugh about something that's been annoying you; or give you the freedom to discuss something that's been worrying you; or allow you to relax, pat yourself on the back and get through another day, or another meal, or another five minutes! I hope that in this recording, you'll find support, respect, courage, acceptance and a song with your name on it! 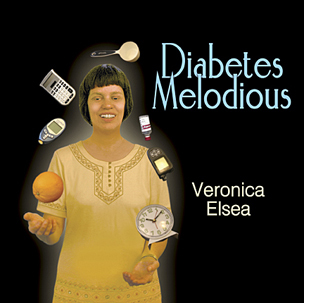 "Diabetes Melodious" is available now, on CD or via computer download! No prescription needed! CDs can be purchased for $10.00 on my secure online ordering page. You can purchase a direct download of the entire album or of individual songs from many of your favorite music download sites. Where else can you buy "Diabetes Melodious"? You can also read all text and descriptions of artwork found in the CD package. Once you've heard your stories in music, if you're hungry for more details, check out the extra points and tidbits page. Otherwise, if you haven't already seen it, this just might be the perfect time of year to find out how "We Woof You A Merry Christmas" to learn about "Guide Dogs, First Hand" to meet "The Guide Dog Glee Club" and to peruse the list of new songs, From The Song Banks Of Laurel Creek. Then I hope to see you on my order page. Enjoy the rest of this site and don't forget to invite your friends!